Why Hasn't Kawhi Leonard Been Traded Yet? For someone who rarely speaks, San Antonio Spurs forward Kawhi Leonard has an awful lot of people in the NBA who would love to talk to him. The fact that they haven't, or can't, is one of several reasons why league executives said a deal that fulfills his wish of not being in San Antonio could take until training camp or even into the season to be consummated. "Teams are going up and around every way they can to find out where he's training, what he's doing," said one Eastern Conference general manager who counts his team among the interested. "There's so much we just don't know." The list of questions is extensive. After playing only nine games last season—culminating in a 28-minute stint January 13—because of an unspecified right quad injury, is Leonard healthy? In light of rumors that he wants to play in Los Angeles because it's close to where he grew up in Riverside, how resolute is he about only re-signing with an L.A.-based team when his contract expires next summer? And, finally, how much influence does Leonard's uncle and de facto business manager, Dennis Robertson, have on his thinking? Nearly half a dozen GMs told Bleacher Report during the first weekend of the Las Vegas Summer League that they would trade for Leonard even without a guarantee he'll stay beyond next season. There is, after all, precedent for players being traded to a team and vowing they won't stay before changing their minds a year later. Paul George just did it by re-upping in Oklahoma City after stating his dream was to play for the Lakers, his childhood team. Chris Webber initially resented being traded by the Washington Wizards to the Sacramento Kings but spurned free agency to sign a seven-year, $122.7 million deal to stay. "I wouldn't say we're all scared to death to make a deal because there's no chance he'll re-sign [with a team somewhere other than L.A.]," said the Eastern Conference GM. "PG did. C-Webb did." The first catch, though, is that Leonard's agent, Mitch Frankel, has no other significant clients and only has been representing Leonard the last couple of years. Hence, he has no established trust with NBA GMs, the kind of trust that allows a team to ask Frankel what its chance would be to keep Leonard long-term and believe whatever he might say is a true reflection of his client's feelings. Another issue is what teams are willing to offer San Antonio without any clear sense of their ability to have him beyond next season. Several GMs said they would deal a quality young player and a future first-round pick even with the prospect that Leonard was just a one-year rental. And then there is the fact that the Spurs have yet to concede they have to trade Leonard and remain hopeful they can convince him to accept their offer of a supermax contract worth $219 million over five years, according to league sources. Given San Antonio's stance, opposing teams are reluctant to name players they'd be willing to trade and risk having those names getting out into the public, potentially injuring the team's relationship with those players if a deal is never done. Several GMs noted that the Spurs' willingness to let point guard Tony Parker leave in free agency could be seen as an olive branch of sorts to Leonard. Parker, who signed a two-year deal with the Charlotte Hornets after 17 seasons with the Spurs, was reportedly the most vocally accusatory in a late-season players-only meeting in which Leonard had the severity of his injury questioned. "They're trying to give the impression that they don't have to trade Kawhi," said one Western Conference GM, who stated he also would make an offer for Leonard if he knew more about his condition and mindset. "The Spurs only like to deal when they have tremendous leverage," he added. "Now they don't have it, and they're trying to create it." That is why waiting until after training camp opens to move Leonard makes sense, presuming he'll take part in their exhibition schedule. "It seems like every other player is putting out a video on social media of them working out," said the Eastern Conference GM. "If Kawhi did one, he'd instantly get 35,000 hits, and half of them would be from NBA GMs. How can you make a deal or even an offer without knowing if he can play? He's got to be seen. If he came out and played in preseason and looked good, you'd definitely see teams trying harder to get him." That gives an edge to several squads in the Eastern Conference. Toronto Raptors GM Masai Ujiri has close ties with Spurs GM R.C. Buford, thanks to a common interest in and support of basketball development in Africa, potentially making Ujiri privy to more information or insight than other general managers. 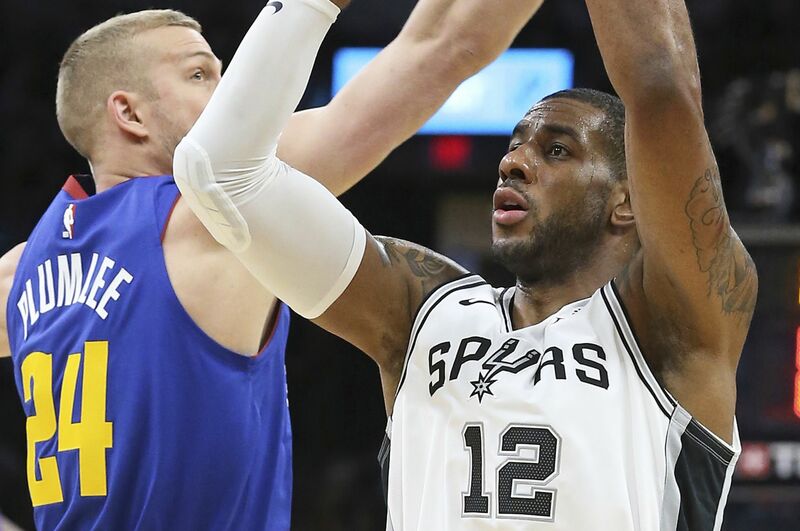 The 76ers have a similar advantage with former Spurs assistant Brett Brown as their head coach and one of their team doctors, based in New York, having been Leonard's personal choice to oversee his quad treatment. Part of the discord between Leonard and the Spurs was the team's initial reluctance to get second opinions, league sources said. Where and when is all this resolved? It's a good question. When it comes to Kawhi, one of many.